Janaki Mandir as the name suggest is devoted to the deity Sita or Janaki, daughter of King Janak of Videha and wife of Lord Ram. The Temple is located in Janakpur which is located in the Terai, alluvial, forested and marshy terrain at the base of the Himalaya mountain range. The major rivers surrounding Janakpur are Dudhmati, Jalad, Rato, Balan and Kamala. Janakpur is famous for its temples and the numerous ponds which carry significant religious importance. Mithilanchal is the place where ancient Maithili culture originated. It has the birthplace of the Chhath festival and the Maithili language and script. 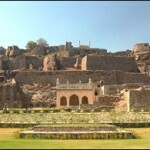 Golconda fort is a majestic monument, which lies on the western outskirts of Hyderabad city. It speaks of a great cultural heritage of 400 years and is regarded as a place worth visiting. Built by Mohammed Quli Qutub Shah in 1525, it stands as the epitome of Nawabi culture and grandeur. A Well Planned Architecture : The magnificent architecture of the Golconda fort is manifest in its acoustic system, the structural grandeur of the palaces and ingenious water supply system. The fort was famous for its diamond trade and the ‘Kohinoor’ diamond is said to have come from here. One is perplexed to see the meticulous details of the architecture and the fading gardens, which were once upon a time replete with sprawling lawns and playing fountains.This is where the priceless Kohinoor diamond was found. One of the famous forts of India, an added attraction here is an enchanting sound & light show in the evenings. Shiv Khori is one of the important cave shrines of Jammu, which is famous for the natural formation of a shivalinga. The 150 metres long shrine is among the most respected cave shrines of Lord Shiva in Jammu.The major highlight of the shrine is the 4 feet svayambhu lingam. The revered figurine constantly baths in a milky lime fluid dripping from the ceiling. There are several natural impressions and images of Hindu deities on the cave walls. The cave consists of two chambers, the outer chamber and the inner chamber. The outer chamber has a capacity to accommodate a large number of people at a time. On the other hand, the inner chamber is small in space.Shiv Khori cave gains special importance during the festival of Mahashivratri. There is a big fair organised near this temple during Mahashivratri. During this time, large number of devotees throng the place so as to see the Shivalingam. In view of the increasing number of pilgrims during the Maha Shivratri Mela, the Shiv Khori Shrine Board has taken up a number of steps to provide more and more facilities to the devotees. The state government administration takes up this task every year to ensure the smooth conduct of the Yatra. The administration keeps a regular check on the langers operating during the festival days for ensuring better eating facilities to the pilgrims and proper security arrangements for the pilgrims coming to take part in Shiv Khori Festival. Popularly believed to have been laid in 1574, the city of Amritsar is one of the most travelled tourist destinations in India due to the existence of several religious sites. It actually offers a host sightseeing options that are considered as some of the best tourist attractions in Amritsar. Powered by WordPress | Web hosting coupons available on our host gator student discounts blog.